On July 7, two 100 Gbps connections between São Paulo and Miami were activated, which expand the international output of the Brazilian academic network. 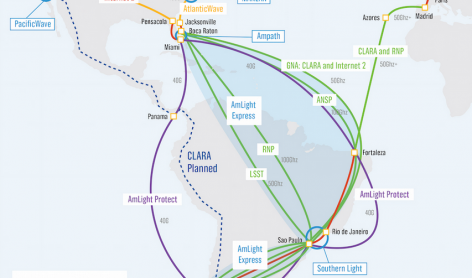 The links, which go through submarine cables in the Atlantic and Pacific oceans, are maintained by the Amlight consortium, which manages the connections between the United States and Latin America for teaching and research purposes. The new interconnections are part of the Amlight Express and Protect project (Award #1451018), financed by the National Science Foundation (NSF), by the Research Support Foundation of the State of São Paulo (FAPESP) and by the Brazilian National Research and Educational Network (RNP). According to network engineer Jeronimo Bezerra, from the Florida International University (FIU), who participates in the Amlight consortium, six other links with the same capacity between Miami and Latin America are expected to enter into production in 2017. According to the FIU, the 100 Gbps international connection sets new high-performance connectivity parameters in the Americas and enables opportunities for scientific collaboration. One of the benefitted initiatives shall be the international Astronomy project Large Synoptic Survey Telescope (LSST), which features the participation of 50 Brazilian researchers. The LSST is a telescope under construction in Cerro Pachón, in Chile, and is expected to enter into operation in 2022. It shall be able to map almost half of the sky for a ten-year period. So the 100 Gbps capacity is used in full by the academic network, RNP also works to elevate the capacity of its national backbone, which serves universities and research institutes in the entire country. Only in São Paulo, the channel may benefit institutions connected to the academic network of the state of São Paulo (ANSP), as well as those connected to RNP, responsible for over 40% of the national scientific production. 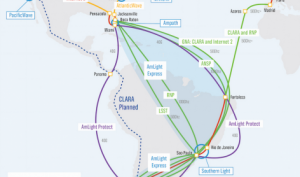 “With this international 100 Gbps capacity, we shall be prepared for the demand that is shaping up for the next three years”, said the RNP’s Engineering and Operations Director, Eduardo Grizendi. One of the main challenges for the activation of this high-performance infrastructure was cleaning the optical fiber cables in the land connections, since any vestige of dirt and oiliness in the interface between the fibers may melt with the heat propagated by data traffic, damaging the physical integrity of the network. “Dirt may not only ruin the signal, it may make the fiber burn”, explained Jeronimo Bezerra, stressing that the problem is more common in connections between telecommunications and last mile operators, up to the users, or even within data centers. Another challenge shall be traffic monitoring in extremely high speed, which shall depend on complex computational resources. One of these resources habilitated in the international connection between Brazil and the United States is the Software Defined Networking (SDN), which allows more flexibility, robustness, and the possibility to program traffic operation. For the original RNP article click here.